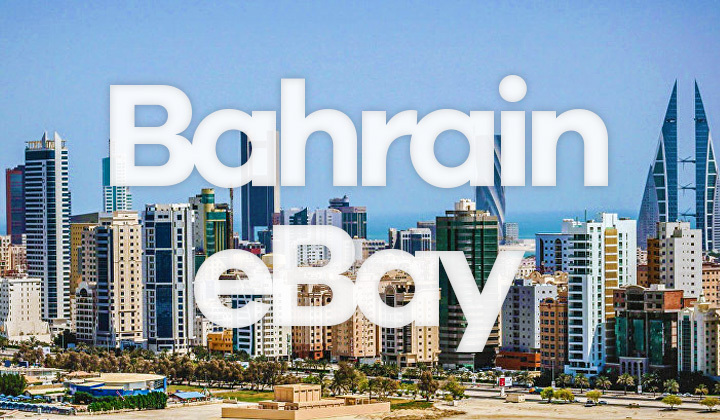 This is my guide to the Bahrain site of eBay in April, 2019, use it for online shopping & auctioning, with shipping, delivery support to Manama and elsewhere. The eBay marketplace is well known and commonly used by both buyers and sellers in Bahrain through the “global eBay website” aimed at users from there. While cash on delivery (COD) is not supported by most eBay sellers, through international shipping and other payment methods the site is undoubtedly the biggest portal for purchasing just about anything through the world. Follow this guide on tips on using the online store for your needs. By detecting your location automatically, eBay serves it’s localized version to visitors from Bahrain for tailored searches results and shipping support. However, use these settings to fine tune your shopping experience. There are many, big eBay sellers are from Bahrain, selling goods overseas. But you can also use this to your advantage and shop locally. Step 2. First fill in the search input field with what you are looking for. Step 3. Then scroll downwards until the “located in” section. Choose the country “Bahrain” from the dropdown list. Step 4. Proceed with your search for an item which will from then on be narrowed down to Bahrain eBay sellers only. Also eBay is popularly used to access the Asian buyer market, for huge availability in a range of items and of course cheap to affordable pricing. Step 2. Proceed with a regular search for the item you need. Step 3. Spot the quick settings from the left of your search results, which contains a region selection for Asia, North America, Europe, etc. Step 4. Click on the region and the search results will change immediately. Does eBay Ship & Deliver to Bahrain? Being a global marketplace and auctioning site, eBay is abundant with sellers that have international shipping support to Manama and other Bahrain cities. Although support does depend on the individual seller, often enough you may individually contact them and ask for a tailored delivery option for your needs. When browsing the site in Bahrain, you will see shipping costs automatically calculated to your country, on top of relevant search results. Cash on delivery is not supported, but you may also contact a seller about that. Especially if they are located in Asia, you might have a chance. When you are outside of Bahrain, you will need to login and have your country location settings and address details set correctly. Otherwise, you can simply check the bottom of each product page for individual shipping support & estimated costs. There should be no problem with delivery to the cities; Jidhafs, Manama, Muharraq, Budaiya, Riffa, Sitra, Al-Malikiyah, Hamad Town, A’ali, Isa Town. As mentioned, pricing is displayed in USD. However, you can make purchases and payments in Bahraini dinar (BHD) easily. Your likely options are to use PayPal, or the other popular option besides using a regular credit or debit card, is to use so called prepaid cards, or virtual credit cards. Nowadays many banks and other companies offer them in Bahrain. Where you can simply top-up your card and use it for online shopping on eBay. You can obtain these cards from CrediMax, BisB, National Bank of Bahrain, Al Salam Bank, MyCard, VIVA Prepaid or ask your local bank. Thanks to the global shipping program provided by eBay, it’s easy to enter the local ecommerce market in the country for international sellers. You have an English language interface, and a popular & easy to use selling portal at your fingertips. Competitiveness in Bahrain is expected to increase. Note, there is no dedicated eBay.bh domain provided by the company. Does this post answer your questions on Bahrain ecommerce? I’m glad to discuss online shopping sites and eBay below. So delighted you could visit this post and website. Big thanks for a share on social media, and happy shopping, David. Also, I wish that readers are aware of the possible affiliate links placed throughout the blog that support the author financially. This is a great help to support my main job, as well as to keep me writing more hopefully useful content.